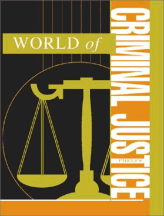 The individual entries in this ready-reference source explain in concise, detailed, and jargon-free language some of the most important topics, theories, discoveries, concepts, and organizations in criminal justice. Brief biographical profiles of the people who have made a significant and lasting impact on the field of criminal justice and society in general are included. Photographs, statistical charts, and graphs aid the reader in understanding the topics and people covered in the reference work.